Treyarch has enlisted a trio of top Hollywood talent for it's upcoming Cold War Call of Duty. Activision has confirmed that Hollywood veteran Gary Oldman will be reprising his role as Russian soldier Viktor Reznov in Treyarch's upcoming Call of Duty game, Black Ops. Oldman is quite experienced in videogame voice acting, having appeared in a number of Spyro games, as well as games like True Crime: Streets of LA and Medal of Honor: Allied Assault - Spearhead. Also lending his voice to the game is Ed Harris, whose career includes movies like Apollo 13 and A Beautiful Mind and is making his videogame debut. Harris will play one of the game's lead characters, CIA agent Jason Harrison. Finally, Activision has hired Dark Knight writer David Goyer as a script consultant and to help develop the game's story. Treyarch boss Mark Lamia said that Harris, Oldman and Goyer were some of Hollywood's best talent, and were a perfect complement to Black Ops immersive single-player campaign. 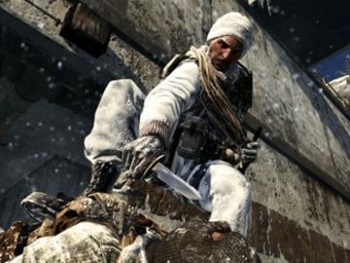 He added that their contributions had allowed Treyarch to push its storytelling and character development beyond anything the series had attempted before. Harris has been nominated for four Oscars, and Oldman has been described as "one of the best actors never to receive an Oscar nomination," so Treyarch has a pair of excellent actors on its hands. Not only that, but Goyer helped create the story for one of the most highly regarded, not to mention highest grossing, comic book movies of all time. It's going to be interesting to see what the game does with so much talent.